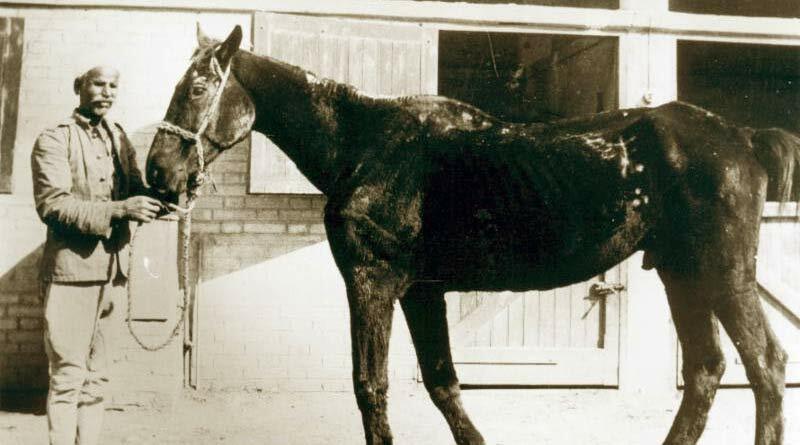 “Old Bill”, one of the first former war horses Dorothy Brooke rescued. His image appears in the Horse Heroes campaign. International equine charity Brooke has celebrated what would have been the 134th birthday of founder Dorothy Brooke, who saved the lives of hundreds of former war horses in Egypt. Upon moving to Cairo, Egypt, after World War I, Brooke was inspired to rescue abandoned war horses who were suffering from intolerably inhumane conditions. Fueled by her love of animals, she took it upon herself to help improve the lives of equine veterans who had been sold into hard labor after the end of World War I. Mounting a campaign in 1931, she dedicated her life to working behind the scenes to save the lives and improve the living conditions of thousands of equines by providing free veterinary care to working equines and educating their owners on modern animal husbandry. “For the sake of any animal you have ever loved, I implore you to help carry on this great and needful work for suffering animals whose lives are ones of unremitting toil,” Dorothy Brooke said of her time in Cairo. As a result of Brooke’s compassion and energy, Brooke Animal Hospital was instituted in 1934 and gave rise to the world’s largest international equine welfare charity that has continued to provide care for working horses, donkeys and mules for more than 80 years. Last year alone, the assistance provided by Brooke reached more than 2 million equines. June 1 was Dorothy Brooke’s birthday, and today, Brooke USA celebrates her legacy by funding veterinary care, proper training and education programs for working equines across Asia, Africa, and Central America through Brooke’s worldwide equine welfare programs. Brooke USA’s mission is to support sustainable equine welfare programs throughout the world by fundraising and stewarding donations to the areas of greatest need. In honor of this year’s centennial anniversary of the US entering World War I, Brooke USA launched Horse Heroes, a campaign with the goal of raising $1 million in honor of the one million American horses and mules who served in the war. They suffered and died while carrying food, water, ammunition and medical supplies for soldiers through difficult terrain and active battlefields. Since January, Brooke USA’s Horse Heroes campaign, an official partner of the US World War I Centennial Commission, has already raised more than $500,000 dollars to support equine welfare programs worldwide. The Commission was established by the US Congress under the World War I Centennial Commission Act. One of the main roles of the Commission is to develop programs to commemorate the historic event and to encourage and facilitate the activities of private, state, and local organizations which are commemorating the centennial. President Obama signed the Act, and Presidents Jimmy Carter, George H.W. Bush, Bill Clinton and George W. Bush are Honorary Chairs of the Commission. Brooke USA funds veterinary care, proper training and education programs for working equines across Asia, Africa, and Central America through Brooke’s worldwide equine welfare programs.